WMFE is public radio for all of Central Florida, on-air, online and in the community. 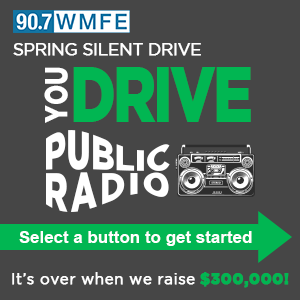 And, you drive what we do — Listener support is WMFE's largest source of funding. Give to our Spring Silent Drive today and stand for fearless reporting, fair and civil conversation, and in-depth news for all. We need raise $300,000, and as soon as we get there, this drive is over and there will be no on-air fundraising until fall. Support independent journalism. Become a sustaining member by setting up a monthly gift. Or, make a one-time gift now. Get started by selecting an option below, or call 1-800-785-2020. We have $195,705 left to raise! To make donations by phone call 1-800-785-2020. WHY SHOULD I GIVE TO 90.7 WMFE? WHY IS THIS DRIVE DIFFERENT? We usually fundraise for six weeks, but this time, the drive is over as soon as we raise $300,000. This might sound like a tall order, but with our more than 200,000 weekly listeners, we can reach it in record time when everyone participates. Don’t wait — Do your part now! We’ve had nearly three years of consecutive successful silent drives, and it has become a trusted tradition. We are committed to this less-intrusive style of fundraising that features short messages asking for support between programs. Please join us in our commitment to not interrupt programming with traditional pitching! WHAT MUSIC AM I HEARING IN DRIVE MESSAGES? We’re happy you asked. Below is a playlist of songs that are featured in our Silent Drive messaging on the air. It’s music to give by. Enjoy! Attend one of the several events hosted by WMFE around the Central Florida area. A sponsorship with public broadcasting makes a powerful statement about any business. Cornerstone Society and McKean Society for annual donations of $1,200 or more. Become a Cornerstone Benefactor member with a donation of at least $1,200 or a Visionary member with a donation of at least $5,000. Contributing through your will, ensures WMFE’s continued impact in Central Florida for generations to come. Support WMFE while you buy music and other merchandise. Through our partnership with Amazon.com, all purchases at amazon.com help support WMFE. Volunteers are valued here at WMFE. If you have the time, we have a need you can fill. Many employers sponsor matching gift programs. If your company is eligible, request a matching gift form from your employer, and send it completed and signed with your gift. We will do the rest.